Both Object-Oriented Programming (OOP) and Functional Programming are the two essential programming methodologies that aim to provide easily understandable, well managed code, free of bugs. However, they use different approaches for storing and manipulating the data. But, which one should you prefer? Let’s take a look at the difference between the two programming paradigms to better understand the two. Object-oriented programming, or simply referred to as “OOP”, is a software programming model based on the concept of objects, instead of just functions and procedures. OOP is so designed that real world concept can be programmed in a computer program. As the name suggests, OOP uses objects in programming which are organized into classes, allowing individual objects to be grouped together. Each object in OOP is responsible for a set of tasks. So, various tasks in the program are performed, by invoking the operations defined on corresponding object. Although, the fundamental features of OOP were invented in the 1960s, it wasn’t until the 1980s that object-oriented languages actually started getting the attention. OOP is a revolutionary idea and there are a number of reasons why it has become the dominant programming paradigm in the last few decades. Functional programming is a programming methodology that emphasizes on the use of function calls as the primary programming construct. It provides practical approaches to problem solving in general and insights into many aspects of computing. It is a style of programming where you focus on the evaluation of expressions rather than the execution of commands. You use expressions to transform the data in the functional programming approach which ideally doesn’t contain side effects. Like the name implies, it uses functions as building blocks to create new functions. Functional programming is generally regarded as a programming paradigm that can be applied in many languages, even those that weren’t intended to be used with that paradigm. In functional languages, there is no fixed execution order meaning the order does not affect the final result. Higher order functions are also important in functional programming. – Object-oriented programming is a software programming model based on the concept of objects, instead of just functions and procedures. 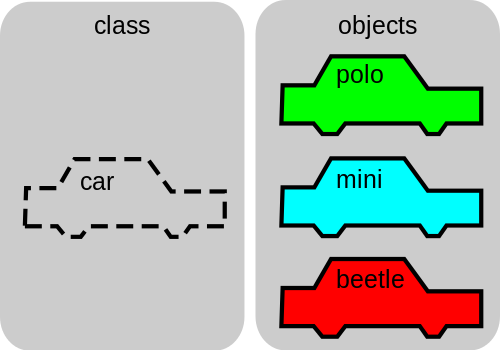 As the name suggests, OOP uses objects in programming which are organized into classes, allowing individual objects to be grouped together. Functional programming, on the other hand, is a programming methodology that emphasizes on the use of function calls as the primary programming construct. It is a style of programming where you focus on the evaluation of expressions rather than the execution of commands. It provides practical approaches to problem solving in general and insights into many aspects of computing. – While both OOP and functional programming are two essential programming paradigms sharing a common goal of creating easily understandable, flexible, and bug-free programs, they follow two different approaches to creating those programs. OOP brings together data and its associated behavior in a single location which makes it easier to understand how programs work. In OOP, programs are organized as cooperative collection of objects where each object represents a set of tasks. In functional programming, on the other hand, data and its associated behavior are considered different entities and should be kept separately. – The four basic principles of object-oriented programming are: abstraction, encapsulation, polymorphism, and inheritance. Abstraction means concentrating on the essentials and hiding the unnecessary details; Encapsulation is the process of combining elements to create a new entity; Polymorphism means the ability to take more than one form; and Inheritance means defining one class in terms of another. Referential transparency is an important concept in functional programming, which means that given a function and an input value, it will return the same result regardless of the order of the program. Higher order functions are also important in functional programming. – OOP follows the imperative programming model that relies on a set of primitives that your language provides. It uses a sequence of statements to change a program’s state. You combine them in a certain way so as to achieve a functionality that you need. You define how it needs to be implemented without specifying what needs to be accomplished. Functional programming is tightly connected to the declarative programming style, which focuses more on what needs to be accomplished than how it’s done. In declarative programming, you also rely on primitives and you use them to express your program. You can also create new primitives as you go. While both OOP and functional programming are two essential programming paradigms sharing a common goal of creating easily understandable, flexible, and bug-free programs, they follow two different approaches to creating those programs. OOP follows the imperative programming model that relies on a set of primitives that your language provides. With OOP, you tell how it needs to be implemented without specifying what needs to be accomplished. Functional programming, on the other hand, is tightly connected to the declarative programming style which only defines what needs to be accomplished without the need for how. Sagar Khillar. 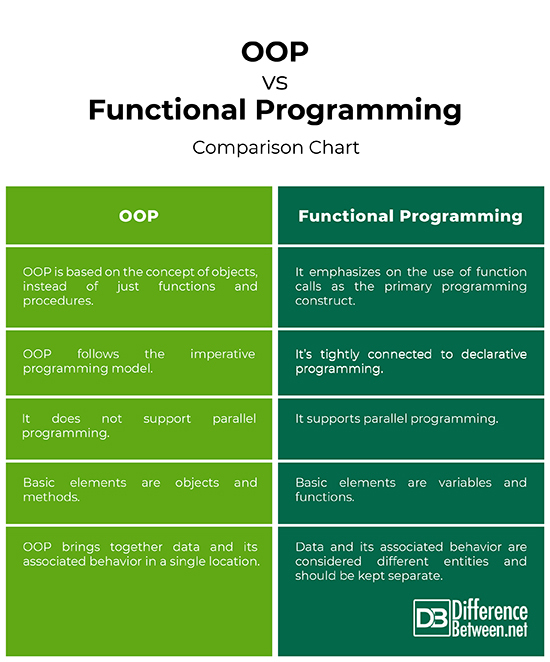 "Difference Between OOP and Functional Programming." DifferenceBetween.net. April 1, 2019 < http://www.differencebetween.net/technology/difference-between-oop-and-functional-programming/ >.